The RM-81 Agena was an American rocket upper stage and satellite bus which was developed by Lockheed initially for the canceled WS-117L reconnaissance satellite program. 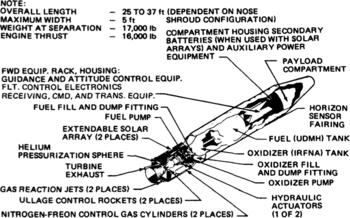 Following the split-up of WS-117L into SAMOS and Corona for image intelligence, and MIDAS for early warning, the Agena was later used as an upper stage, and an integrated component, for several programs, including Corona reconnaissance satellites and the Agena Target Vehicle used to demonstrate rendezvous and docking during Project Gemini. It was used as an upper stage on the Atlas, Thor, Thorad and Titan IIIB rockets, and considered for others including the Space Shuttle and Atlas V. A total of 365 Agena rockets were launched between February 28, 1959 and February 1987. Only 33 Agenas carried NASA payloads and the vast majority were for DoD programs. On some missions, the payload was built directly into the Agena, which provided it with electric power, communications and three-axis stabilization. Payload components were usually located ahead of the Agena's standard bulkhead. On missions where the payload was not built into the Agena, and instead separated after launch, the Agena was known as an Ascent Agena. The Agena was upgraded twice from the original Agena A in order to support heavier and more sophisticated satellites, such as Corona spacecraft with multiple and more powerful cameras. The Agena name was suggested by the Department of Defense's Advanced Research Projects Agency for the star Beta Centauri, also known as Agena, because this upper stage would "ignite in the sky". This followed Lockheed's tradition of naming products for stellar phenomena. The final launch was of an Agena D on February 12, 1987, configured as the upper stage of a Titan 34B. In all, 365 Agena vehicles were launched by NASA and the US Air Force. The Agena was 5.0 feet (1.5 m) in diameter, three-axis stabilized (for the benefit of the reconnaissance system cameras) and its Bell Aircraft XLR81 engine produced 16,000 lbs. (71 kN) of thrust using unsymmetrical dimethylhydrazine (UDMH) as the fuel, and inhibited red fuming nitric acid (IRFNA) as the oxidizer. This is a hypergolic fuel/oxidizer combination, and as such, it does not need an ignition system. This rocket engine could be restarted multiple times in orbit, by radio command, and it frequently was. The engine was notable for its unusual aluminum construction. The regeneratively-cooled channels that cooled the throat and nozzle were formed from straight gun drill formed channels. The parabolic shape of the chamber throat made for a difficult gun-drilling problem, which Bell Aerosystems engineers solved by arranging the cooling channels in a "One-Sheeted Circular Hyperboloid" shape, allowing machinists to gun-drill straight cooling channels through the curved surfaces of the combustion chamber. 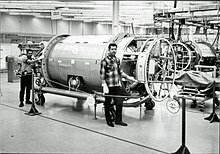 The engine was derived from the XLR-81 propulsion unit for the canceled rocket-propelled nuclear warhead pod of the Convair B-58 Hustler bomber. Until 1959, the Agena was also known as the Discoverer Vehicle or Bell Hustler. Attitude control of the horizontal flying Agena was provided by an inertial reference package with three gyroscopes, two horizon sensors, and micro-jets using a nitrogen-freon mixture of cold gas. Pitch and roll were sensed by two hermetic integrating gyro units. A rate gyro unit determined yaw error by sensing orbital rate. Pitch and roll gyro errors were corrected from the horizon sensors, which were later supplemented by Sun and star trackers. This enabled the Agena to accommodate the higher pointing stability required for better ground resolution imaging with the improved Corona cameras. As the Agena was designed to hold a fixed orientation in space while orbiting Earth, a passive thermal control system was devised. The main source of the Agena's electrical power was silver peroxide-zinc batteries, which from the early 1960s on were supplemented by solar arrays. An S-band beacon enabled the Agena to receive ground command sequences (image motion compensation, altered attitude, etc. ), which could be stored for later execution. The Agena A was the first type of Agena to be built. It was launched atop Thor and Atlas rockets, mostly into polar orbits from Vandenberg Air Force Base Launch Complex 75 and Point Arguello Launch Complex 1 respectively. Two Atlas launches occurred from Launch Complex 14 at Cape Canaveral. The Agena-A was propelled by a Bell 8048 (XLR-81-BA-5) engine, which could produce 69 kilonewtons of thrust for two minutes. Eighteen Agena As were launched in 1959-61, all of them for the Discoverer, MIDAS, and Samos programs. 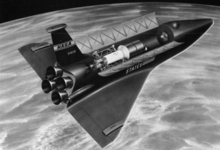 During 1960, Lockheed introduced the improved Agena B, which could be restarted in orbit and had longer propellant tanks for increased burn time. 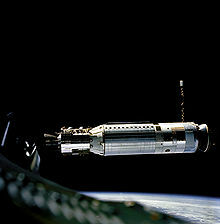 It was equipped with a Bell 8081 engine, which could generate 71 kilonewtons of thrust, and be restarted in orbit. The stage carried enough propellant for the engine to burn for a total of four minutes. These launched the SAMOS-E, SAMOS-F (ELINT Ferret), and MIDAS (Missile Defense Alarm System) military early-warning satellites, Ranger lunar probes, Mariner planetary probes, OGO, and Nimbus satellites. Agena B's maiden voyage was the (unsuccessful) launch of Discoverer 16 on October 26, 1960. The Agena B took months to be ready for Atlas launches and did not fly on that booster until Midas 3 on July 12, 1961. 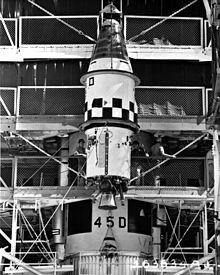 The final Agena B flight was the launch of OGO 3 on June 7, 1966. A total of 75 were launched. Its orbital configuration had a diameter of 60 in (1.5 m) and a length of 248 in (6.3 m), and provided 19,500 Wh of electrical power from batteries. As of 2014, the Agena-D is the most-launched American upper stage. A special production line was set up to turn out 40 Agena-D spacecraft per year. Edwards remained responsible for the engineering for several years, until the Air Force declared the Agena-D as operational and froze its design. By the time of its retirement, the reliability of the Agena-D exceeded 95 percent. The first Agena D launch was of KH-4 #7 on June 28, 1963, and a total of 269 Agena Ds were launched. Thor-Agena flew for the last time in 1972 when it launched a KH-4B satellite. The last Atlas-Agena used an Agena D stage atop a refurbished Atlas F missile to launch Seasat in 1978. Twelve more Agenas were launched on Titan vehicles through 1987 before the stage was completely retired. The Agena-D was used to launch KH-7 GAMBIT and KH-8 Gambit 3 reconnaissance satellites, three Mariner probes to Venus and the two Mariner space probes to Mars. The final Agena-D upper stage was launched on a Titan IIIB rocket on February 12, 1987, carrying USA-21, the last SDS-1 satellite. The Agena Target Vehicle was based around the Agena-D, with equipment fitted to support use as a rendezvous and docking target for missions conducted as part of Project Gemini. It was equipped with a Bell Aerospace Model 8247 engine, which was qualified for up to 15 restarts. On later missions, the Agena's engine was fired while the Gemini spacecraft was docked, in order to boost the spacecraft to a higher orbit, and to bring it back again. During the Gemini 11 mission, an elliptical orbit with an apogee of 1,375 kilometers (854 mi) was reached, which set an altitude record for manned spaceflight that held until Apollo 8, the first manned mission to the Moon, was launched. In the early 1970s Lockheed studied the use of Agena as a payload booster in the Space Shuttle payload bay. An Agena-C with an increased diameter was proposed, but never built. The Agena-2000 was intended as a modernized Agena, and would have been used on the Atlas V Light Evolved Expendable Launch Vehicle. The Atlas V Light was cancelled in favor of standardizing the Medium configuration, and as a result the Agena-2000 was never built. Success 8 18 32 26 36 26 20 17 14 10 6 4 3 4 4 4 4 1 1 2? 1 2 2 1 1 245? Failure Agena – 3 3 1 2 1 – – – ? ? ? – – – – – – – – – – – – – 10? Booster – 2 – 2 1 1 1 – – ? ? ? – – – – – – – – – – – – – 6? ^ a b c d Jacob Neufeld; George M. Watson, Jr. & David Chenoweth (1997). "Technology and the Air Force A Retrospective Assessment" (PDF). Air Force History and Museums Program. ^ a b c Lockheed Missiles & Space Company (1972-02-25). "Shuttle/Agena study. Volume 1: Executive summary". NASA. ^ a b "HISTORY - AGENA AS OF 31 DEC67, VOLUME I" (PDF). SPACE AND MISSILE SYSTEMS ORGANIZATION AIR FORCE SYSTEMS COMMAND. June 1966. ^ Helen T. Wells; Susan H. Whiteley & Carrie E. Karegeannes. Origin of NASA Names. NASA Science and Technical Information Office. pp. 6–7. ^ "Lockheed RM-81 Agena". www.designation-systems.net. ^ "Bell Model 8048". National Museum of the U. S. Air Force. Retrieved 24 March 2018. ^ "Factsheets: Bell Model 8048". National Museum of the USAF. Archived from the original on 2010-12-25. Retrieved 2011-01-29. ^ David N .Spires (1998). "Beyond Horizons: A Half Century of Air Force Space Leadership". Air Force Space Comman. ^ "Feasibility Study, Final Report, Geodetic Orbital Photographic Satellite System, Volume 2" (PDF). NRO. June 1966. ^ Genesis of Agena D: America's Most-Used Space Vehicle, lead article in Cold War Space History: Programmes, Space Chronicle, May 2006. Edited by Dwayne A. Day. ^ Krebs, Gunter. "Atlas-5". Gunter's Space Page. Retrieved 20 July 2010. ^ "Document History of AGENA - Volume 6" (PDF). NRO. 28 August 2017.